Offshore structural analysis software helps in construction of offshore structures used in the marine, oil & gas, power generation, government & defense environment. The offshore structural analysis software provides dynamic response & impact effect analysis due to environmental loads and nonlinear structural analysis. It also reduces the risk of offshore structural failure. The software can also predict the offshore structural performance. The global offshore structural analysis software market has been segmented based on component, end-user industry, and geography. In terms of component, the market is segmented into software and services, where software is further segmented into cloud and on-premise and services is segmented into managed and professional. Based on end-use industry, the market is segmented into maritime, oil and gas, power generation, and government and defense. The on-premise software segment is expected to have strong market attractiveness. This is primarily due to strong penetration of on-premise software across the world as well as security concerns associated with online or cloud-based software. However, cloud-based software is estimated to hold a high CAGR index for offshore structural analysis software. This is mainly due to increasing demand for dynamic, cost effective, and efficient offshore structural analysis software from end-users such as architects, engineers, contractors, and owners across the oil and gas, marine, power generation, and government and defense industry.The oil and gas industry segment is expected to have strong market attractiveness, due to large number of offshore projects in this industry in which offshore structural analysis software is used for the designing of the structure. Additionally, rising emphasis of architects, engineers, and contractors on use of offshore structural analysis software is creating demand. This is likely to increase the adoption of offshore structural analysis software in near term. Significant opportunities are being witnessed in marine, and oil and gas, power generation, and government and defense engineering domains, which deal with extreme weather conditions, physical space constraints, and remote locations. These constraints provide an opportunity for engineers to develop a safe and reliable operating platform in an extreme environment, with the use of offshore structural analysis software.Growing technological advancements in subsea protective structures, platforms, drilling templates, skidding systems, tension decks, and other related offshore structure components are creating new opportunities for software vendors present in the offshore structural analysis software market. In terms of region, Asia Pacific led the offshore structural analysis softwaremarket in the year 2017 and is expected to remain dominant throughout the forecast period from 2018 to 2026. This is due to growing demand for structures with high maintenance power along with growing investments in the oil and gas industry. North America has prominent market share on account of the growing awareness about offshore structural analysis software and rise in cloud-based services which is reducing the high maintenance and operating cost associated with the offshore structural analysis software. Europe also is expected to witness significant growth in the coming years due to adoption of offshore structural analysis software and technical awareness about the functioning of offshore structural analysis software. The global offshore structural analysis softwaremarket is largely driven by solutions offering and partnerships. For instance, Zebec Marine Consultant and Services Company is focused on offering solutions to sectors such as engineering, marine design, and risk management which includes turnkey project management services, asset integrity management, and HSE consulting & training and for commercial shipping, oil & gas offshore / onshore industry and ports. Key players profiled in the global offshore structural analysis software market include DNV GL AS, John Wood Group PLC, Ramboll Group A/S, Stewart Technology Associates, Viking Systems, Inc., Zebec Marine Consultant and Services, Dlubal Software GmbH, Baker Engineering and Risk Consultants, Inc., Bentley Systems Inc., and BMT Group Ltd. This report by Transparency Market Research on the global offshore structural analysis software market analyzes and forecasts the data at the global and regional levels. The report provides an analysis of the industry trends in each of the segments from 2016 to 2026, where 2018 to 2026 is the forecast period and 2017 is the base year. The global offshore structural analysis software market report provides in-depth and accurate analysis of the market. It also highlights various drivers, restraints, and opportunities expected to influence market growth during the forecast period. The study provides a complete perspective about the offshore structural analysis software market and expansion throughout the research study in terms of value (US$ Mn) across North America, Asia Pacific, South America, Middle East & Africa, and Europe. Moreover, the study explains the penetration of each market segment within various regions and how these segments have accelerated the growth of the market. The offshore structural analysis software market report covers all the major trends and technologies playing a major role in market growth from 2018 to 2026. The overview section of the report analyzes market dynamics such as drivers, restraints, and opportunities that influence the current nature and future status of this market, key indicators, integration challenges, adoption analysis, and trends of the market. A market opportunity analysis for every segment has also been included in the report to provide a thorough understanding of the overall scenario in the offshore structural analysis software market. The report also provides an overview of various strategies adopted by key players in the market. The report segments the global offshore structural analysis software market on the basis of component and end-use industry. Component is segmented as software and services, where software is further segmented as cloud and on-premise and services is further segmented as managed and professional. End-use industry is segmented as maritime, oil and gas, power generation, and government and defense. In the component segment, software accounts for highest market share in 2018 due to rising demand for cloud based engineering software that provides greater ease, storage, and security. Significant growth is expected in the future due to rise in advanced product visualization for the development of quality products with a better quality of structural design and drawing. 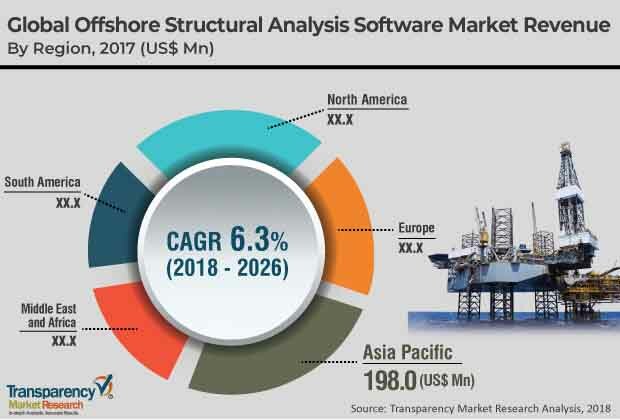 The report also highlights the competitive landscape of the offshore structural analysis software market, thereby positioning all the major players according to their geographic presence and recent key developments. The comprehensive offshore structural analysis software market estimates are the result of our in-depth secondary research, primary interviews, and in-house expert panel reviews. These market estimates have been analyzed by taking into account the impact of different political, social, economic, technological, and legal factors along with the current market dynamics affecting the offshore structural analysis software market growth. This report provides all the essential information required to understand the key developments in the global offshore structural analysis software market and expansion trends of each segment and region. It also includes strategies, company overview, and key competitors under the company profiles section. Additionally, the report provides insights related to trends and their impact on the regional market. Moreover, Porter’s Five Forces analysis provides analysis of bargaining power of buyers, bargaining power of suppliers, threat of new entrants, threat of substitutes, and degree of competition in the global offshore structural analysis software market. The study provides a comprehensive ecosystem analysis of the global offshore structural analysis software market, explaining the various participants including software & third-party vendors, system integrators, and distribution channels of the value chain operating in the market. The research methodology is a combination of primary research, secondary research, and expert panel reviews. Secondary research sources such as annual reports, company websites, broker reports, financial reports, SEC filings and investor presentations, national government documents, internal and external proprietary databases, statistical databases, relevant patent and regulatory databases, market reports, government publications, statistical databases, World Bank database, and industry white papers are usually referred. Primary research involves telephonic interviews, e-mail interactions, and face-to-face interviews for detailed and unbiased reviews on the global offshore structural analysis software market, across regions. Primary interviews are conducted on an ongoing basis with industry experts and participants in order to get the latest market insights and validate the existing data and analysis. Moreover, the data collected and analyzed from secondary and primary research is again discussed and examined by our expert panel.